It is easy to extend the benefits of a Maltese RP to your family: once you received your permit, your close family members can apply for their own permits via family reunification. This includes your spouse, all children under 18 (also from previous marriages), unmarried dependent children between 18 and 26, and dependent parents or grandparents (either yours or your spouse’s). The Maltese golden residency program is the fastest in Europe: it only takes 1-1.5 months. The process is also quite straightforward. A non-returnable advance fee of EUR 5,500 has to be paid at the time of submitting your application. This covers the stringent due diligence checks. If your application is approved, you will make the rest of the required investments, after which you will receive your residence permit. You only have to travel to Malta once during the procedure, to have your biometric data registered. Family members can acquire residence permits based on the family reunification procedure once the main applicant’s permit has been granted. You do not have to physically live in Malta once you acquired your RP, but you have to maintain your residential property. Your residence permit is initially granted for 5 years, but it is renewable indefinitely, and the investment only has to be maintained for the first 5 years. A Maltese residence permit grants you and your family unrestricted travel rights within the Schengen zone in the EU. It also makes it possible for you to reside in Malta indefinitely. 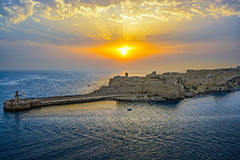 Residency through investment in Malta requires three transactions. First, you have to invest EUR 250,000 in government bonds for five years. After this period, your investment will be returned in full, guaranteed by the state (the rating of Maltese bonds is “A”). Second, you have to pay a non-refundable contribution of EUR 30,000, with EUR 5,500 of this sum payable as an advance at the start of your application process. Finally, you have to buy or rent property on Malta, to be maintained as long as your residence permit is valid. If you decide to buy, you have to purchase real estate for at least EUR 320,000 (EUR 270,000 in some areas). Alternatively, you can lease a property for at least EUR 12,000 per annum (EUR 10,000 in specified areas).